With a summit at 2,429 meters (CBB: 2,431 and summit sign: 2,436), the Furka Pass ranks as 4th highest pass in Switzerland. The pass connects the cantons of Valais and Uri. It’s part of the most famous routes – or round trips – of the Alps. It can be combined with the Grimsel pass – which it ‘meets’ in Gletsch – and Susten passes (north loop), or the Grimsel, Nufenen and Gotthard passes (south loop). More info on the various loops on the pages of the Alpenbrevet. 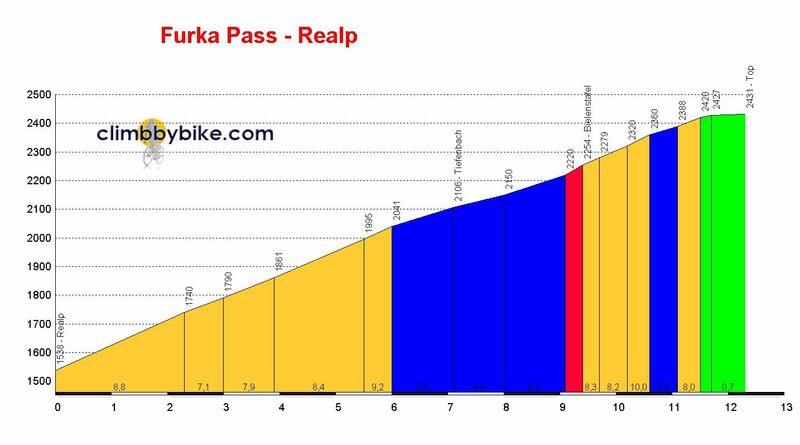 I cycled the Furka from Realp as part of the ‘Swiss Stage’ at the end of my Giro d’Italia 2015 – report here, pictures here (Google+). As I came descending of the Gotthard pass, I turned towards Realp in Hospental. The ‘Furkastrasse’ starts there and the flat section of about 5 kilometers offers some stunning views of the surrounding mountains and gives you a bit of (extra) recovery – or can be used as a warming up – before the climb starts. The official part of it, is 12.3 kilometers long, with an elevation of 893 meters, or 7.3%. As soon as you leave Realp, you’ll be passing the 2,000 meter mark within 6 kilometers, averaging 8.4%, but with several stretches well over 10%. Some 2 kilometers in, you’ll pass the ‘Bond Street’ sign: it’s the spot where Bond was shot at in the movie Goldfinger and it offers a nice view over Realp and the valley behind it. After the first demanding half, you’ll have some 3 relatively easy kilometers at 6%, a short steep section, followed by the last third of the climb. There’s a nice restaurant called Furkablick just before the summit; the restaurant at the summit was deserted when I was there and it looked ‘out of business’. The one that is open, does honor it’s name, because if you can sit outside, the view is fabulous. From the west, the ascend of the Furka is 16.5 kilometers long, with 1,063 meters of elevation gain (6.4%). Just because it’s 4 kilometers longer, it’s ranked as slightly more difficult than the ascend from Realp. I beg to differ, but to be honest: I didn’t climb the whole thing, just the part up to Gletsch. And because the wind was howling at – and against – me most of the second half of that 6.2 kilometer stretch it has in common with the Grimsel, I didn’t particularly enjoy it anyway. Still, the views along the river/stream Rhône and the train track – I even saw a train going up – are breathtaking, as you can see the Grimsel switching left to right above you. From Gletsch, you’ll climb in a near straight line – at just over 6% average – to the other side of the valley, where the steeper (8.3%) hairpin section takes you past the hotel Belvedere. This might well be a place you’d want to spend some time, if only to take a picture of the jaw dropping view on both the Furka and the Grimsel. After the hairpin section, another more or less easier straight at a 3% average takes you to the summit.